Periodically taking snapshots of your VMware ESXi virtual machine state is essential to being able to revert problematic application upgrades and quickly correct other issues. However, allowing VMware snapshot files to accumulate without proper oversight can have a profound effect on virtual machine performance. In fact, if your storage runs out of free disk space, your virtual machines may not be able to even start, let alone run at peak performance. Therefore, to mitigate problems that could threaten the availability or integrity of your data, you need proper VMware snapshot management. You can take multiple snapshots of a virtual machine, including its memory, to create multiple state-in-time restore points. This strategy increases the resiliency of your infrastructure. However, snapshot files take up disk space, so you need to control snapshot creation and deletion to make sure that the size of the free space on your storage is enough for your production needs. VMware Snapshot Manager provides only limited snapshot management functionality. You can see the snapshots of only one virtual machine at a time. Plus, to get the detailed information you need to manage snapshots, such as VMware snapshot size or disk space requirements, you have to go to the storage. Therefore, while VMware Snapshot Manager is useful, it may not be sufficient to enable you to take control over VMware snapshot creation across all of your virtual machines in order to minimize the risks to memory, storage and performance. Gain complete visibility into all changes across all of your virtual machines, including snapshot creation, modification and deletion. Avoid downtime by quickly spotting and investigating the creation of multiple snapshots to discover who made them, when they were made, and on which machines. Immediately respond to unauthorized snapshot deletions and other aberrant activity by creating alerts on threats. 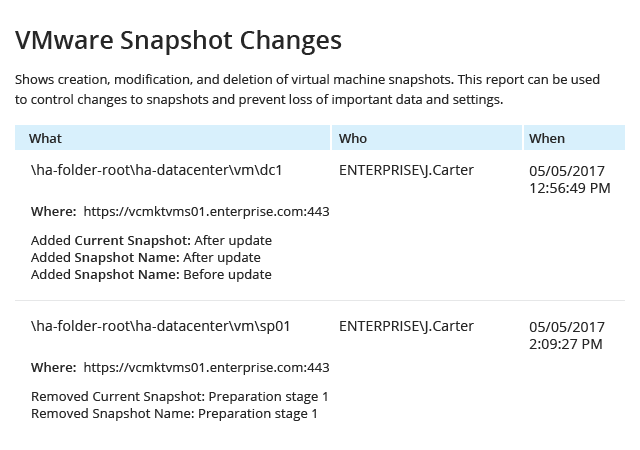 Stay informed about snapshot activity by simply subscribing to the VMware Snapshot Changes report, which will be delivered automatically on the schedule you specify.